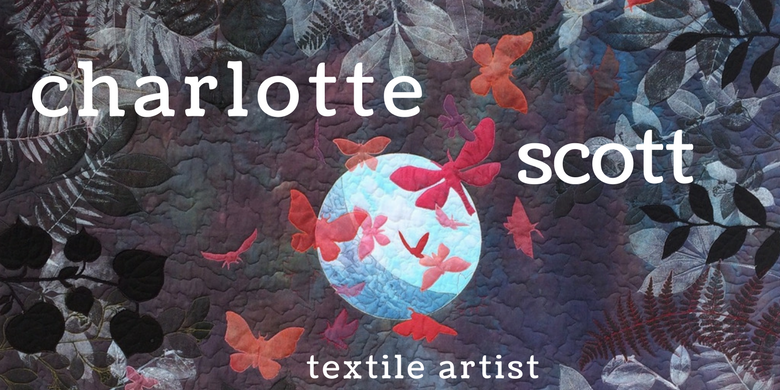 Charlotte Scott - Textile Artist: How I use plant prints in multiple ways in my art quilts. How I use plant prints in multiple ways in my art quilts. I'm enjoying making videos of my art making processes. They are home-made videos without a whole heap of post-production editing, they are not scripted, they contain bloopers, the camera moves occasionally, and the sound is not perfect. But that also makes them fun and relatively quick to do. Plus, we are all makers, so we enjoy seeing a bit of hand-made imperfection, don't we?! This video features yours truly running through the way I take one flora or plant print that I like and then use it in several different ways in my textile art. Are you enjoying seeing my work processes? Is there anything in particular you'd like to see me run through? And, of course, if you'd like to see any of this in person, your guild could book me for a class! I can put together personalised classes on any of the processes I use in my textile art, just email me here and we can discuss your club's needs.